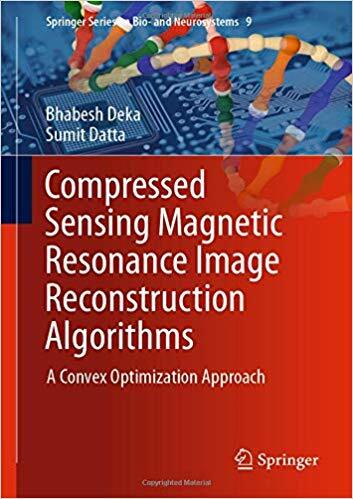 Bhabesh Deka and Sumit Datta, "Compressed Sensing Magnetic Resonance Image Reconstruction Algorithms: A Convex Optimization Approach"
This book presents a comprehensive review of the recent developments in fast L1-norm regularization-based compressed sensing (CS) magnetic resonance image reconstruction algorithms. Compressed sensing magnetic resonance imaging (CS-MRI) is able to reduce the scan time of MRI considerably as it is possible to reconstruct MR images from only a few measurements in the k-space; far below the requirements of the Nyquist sampling rate. L1-norm-based regularization problems can be solved efficiently using the state-of-the-art convex optimization techniques, which in general outperform the greedy techniques in terms of quality of reconstructions. Recently, fast convex optimization based reconstruction algorithms have been developed which are also able to achieve the benchmarks for the use of CS-MRI in clinical practice. 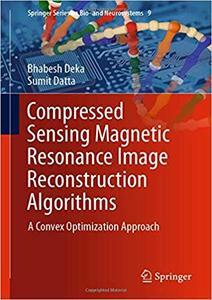 This book enables graduate students, researchers, and medical practitioners working in the field of medical image processing, particularly in MRI to understand the need for the CS in MRI, and thereby how it could revolutionize the soft tissue imaging to benefit healthcare technology without making major changes in the existing scanner hardware. It would be particularly useful for researchers who have just entered into the exciting field of CS-MRI and would like to quickly go through the developments to date without diving into the detailed mathematical analysis. Finally, it also discusses recent trends and future research directions for implementation of CS-MRI in clinical practice, particularly in Bio- and Neuro-informatics applications.